Rajasthan is changing, growing and progressing with each passing day. We are proud to share ‘Faces Of Rajasthan‬’ – Stories of people who truly showcase the Face of ‪Resurgent Rajasthan‬. The pursuit of economic development in isolation could be seen as policy myopia. The success of policy interventions and governance is best measured by the happiness of citizens. Such happiness draws its strength from the harmony of economic, social and environmental development goals. It is on this bedrock of happiness that the Rajasthan model of development rests. This model draws its lifeline from the triad of livelihoods, access to infrastructure and opportunities and effective service delivery. Our efforts are bearing fruit. In every corner lies a story of hope. Across the length and breadth of the state, countless dreams are coming true, bringing in prosperity and happiness for our people. We shall toil on. There shall be no sleeping for us till there is a sparkle of joy in every eye, a hint of smile on every face. These 3D models have made numbers and shapes easy for Ravi, a 4th standard student at the government school at Sukhpuriya. Rajasthan’s model of pedagogy and evaluation through Continous and Comprehensive Assessment (CCE) for primary school students is unique and has matured through rigorous research. The fundamental principle is that each child has a different pace of learning and this methodology allows tracking that differentiated pace. Another pillar of CCE is joyful learning using pictures, models, activities, etc. The initiative will impact learning outcomes of about 65 lakh children from 63 thousand schools across the state. The school hours are over and Kanta along with her friends, still in her clean blue-white uniform, is savoring the evening snack. The hostel has an aura of a sprightly positivism with cheerful faces, keenly occupied in the reading room or playing area. Sharde Girls Hostel scheme is giving wings to thousands of dreams once caged in the cobs of poverty, inaccessibility and ignorance, in 186 educationally backward blocks (EBBs) of the State. The hostels are located closer to the schools and have comfortable living and learning facilities under mentorship and care of a warden and two supporting staff members. The vision is to make secondary and senior secondary education accessible to a larger number of girls, primarily from minority sections and BPL families. SINCE CHILDHOOD, I HAVE DREAMT OF DRIVING A LOCOMOTIVE. I WANT TO WORK FOR THE RAILWAYS AND SUPPORT MY FAMILY. all 33 districts and another 200 are coming up shortly. These skilling institutions are ready to fuel a manufacturing revolution in the State, and also to fulfil countless dreams like Deepika’s. It’s late afternoon at a small forest post at the outskirts of the hilly forest at Thomlaberi. Lassi Bai and her friends from the local tribal community are preparing incense sticks using bamboo, flowers and herbs collected from the forest. State’s Forest Department created a Forest Protection & Management Committee here involving local tribal families and set up a small processing unit with hand-operated machines. Training was imparted to these women who now source material from the forest, prepare various products and pack them for sale through cooperative agencies. They are able to earn about 200 rupees a day on job-work basis, sufficient for a daily meal for the family. They will soon be ready to take over the operations completely, as a self help group. Like her friends, she loves the forest… now even more than she ever has. processing custard apples and trains other tribal women. A farmer by birth, Rajaram and his family forever have done conventional farming, growing vegetable, pearl millet and wheat on his farm. In 2008, with financial assistance and guidance from the state government, he and his wife, Mamta set up a green house and started growing Gerbera. His life, like his farm, blossomed like never before. He now makes more money from the green house alone, than he used to make from the entire farm. The state government has made numerous interventions to encourage farmers to adopt new farming practices and crops. Like Rajaram, farmers across Rajasthan are now growing high value crops including olives and strawberries. Daulat Ram, a metal craftsman, works in a handicraft factory in Jodhpur. Jodhpur has developed as one of the most important industrial centres in the State. It is a vibrant cluster for handicraft industry that employs over one lakh people. Almost all of these units are micro, small or medium enterprises. Jodhpur ships thousands of containers across the world every year bringing in precious foreign reserves and prosperity to families of these people. MSMEs are an important part of the state’s economy; they employ close to 1.9 million people. Government of Rajasthan has developed 58 MSME and Handloom & Handicraft clusters across the State. A special MSME Policy too has been launched to give further fillip to growth of micro, small and medium enterprises for greater employment generation and economic development across regions. Popular as the ‘lady robot’ among her colleagues Jasu Devi is one of the finest welders in this world-class manufacturing facility of JCB and manages the robot station. She belongs to Boravar village in Nagaur. She is an earning member of her family and her parents’ pride. Rajasthan has been aggressively promoting itself as an investment destination as a result of which many leading multinationals and Indian corporations have set up their operations in the State, providing employment avenues to thousands. While pursuing their degrees at IIT Delhi, these three minds were eager to help students prepare for competitive exams without the need to go to coaching classes. These changemakers, hailing from different parts of Rajasthan, engineered a way of learning Science, Maths & Social Science with innovative teaching aids and methodologies. Their initiative, Srjna, has created over 200 innovative and portable subject-learning models for schools on experiential learning approach. Srjna is currently working with about 3000 students. In the wake of the startup revolution across the globe, Rajasthan has also manifolded efforts to foster a startup ecosystem. The new Startup Policy of Rajasthan aims to set up 50 incubators offering support to over 500 innovative startups to feed into the ambitions. Ram Prasad Chaudhary grows maize in his farm at the outskirts of the village. With sacks full of a small harvest from one corner of his farm laden on his bicycle, he strides with pride on his new village road. The state government is constructing a Gaurav Path (literally, pride street) – a 3.75-metre wide cement concrete road in every village Panchayat. The street usually runs through the entire village as its main artery giving it a critical transportation infrastructure. Bright as a button, Deepika holds an avocation for reading and aspires to become a teacher soon. As a high development priority, Rajasthan is investing to foster rural electrification in the underdeveloped regions of the State, enhancing the quality of life of many. Installed power generation capacity in the State is nearly 16000 MW, close to one-fourth of which comes from renewable sources. Government is further augmenting the generation capacity and plans to add 6000 MW over the next five years. Industrial units, farms and residential units get an assured supply of quality and safe power. The electrification drive has lit up many rural households and lives across the State. For about 120 families in Baget village, a single drying open-well was the only source of drinking water. A few years back, the state government connected Baget to Bisalpur water supply project and built 14 community taps across the village, Indira & Narmada now have water closer to home. The villagers took over distribution and infrastructure management in their own hands. All families contribute equally to the village water bill and a surplus that is used for regular repair & maintenance of pipes, taps, etc. Baget is not an isolated example. Given the staggering task of making drinking-water available to its residents – close to 40000 villages and over 120000 habitations in all, across the length and breadth of India’s largest state–this model is a win-win for the State and its people. In many parts of the State, owing to over-extraction, groundwater level has dropped and fluoride & other suspended particles in water have gone up significantly. Consumption of such water over a long period causes chronic stomach disorders, joint pain and teeth & bone deformities. For thousands of habitations in such areas not connected with a surface-water project, the government is installing RO-based water purifying plants right there in the villages. These plants are set up on a unique PPP model offering entrepreneurship opportunity to local villagers. These are powered by solar energy, are fully automated, have zero water disposal and have the facility of water vending through RFID access card. Pure water is provided at a token price of 20 paise per litre. For residents of Lala Ram’s village struggling for years, clean drinking water means a new life. Manoj is now able to consult a specialist at a government PHC just next to her village. Towards significantly improving delivery of healthcare services in rural areas, the State has opened up the sector for public-private-partnership. While the state government provides the necessary infrastructure, medicines, equipment and operational costs, the private-sector specialists manage doctors, paramedic and other staff. The services at these centres include free OPD, 6-bed IPD, 24-hour emergency scheme, maternal and child healthcare, family planning, vaccination and other facilities. 90 rural PHCs are already operational under this programme including this one in Manoj’s village. Naresh works as a Captain in the F&B Department at Samode Palace, a leading heritage hotel in Samode, a village in Jaipur district. The hotel provides direct and indirect employment to a large part of the population of this village. The State sees tourism as an important and sustainable source of livelihood for people. This underlines Rajasthan’s renewed focus on heritage conservation and tourism promotion. The new Tourism Unit Policy offers numerous concessions and incentives for conversion of heritage properties into heritage hotels such as the Samode Palace. METRO IS SO QUICK, COMFORTABLE, SAFE AND AFFORDABLE TOO. Ramanpreet works with a web-tech company in Jaipur as a business analyst. Her office is about 10 km from her residence. Commuting to work and back in a city is a daily grind for residents of any city in the world. Transport plays a crucial role in improving quality of life by providing easy access for people to education, markets, employment, recreation, healthcare and other key services. Ramanpreet takes a feeder bus from close to her office to the nearest Metro station. And then, thanks to the Metro, she’s home in the next 20 minutes. Bhamashah Yojana is a unique initiative of financial inclusion, direct benefit transfer and women empowerment. At the time of Bhamashah enrolment, family’s core bank account is opened in the name of the lady of the house and all family benefits accruing to the family are transferred direct to this account. Over 95 lakh families (3.25 crore individuals) have been enrolled under Bhamashah Yojana and benefit transfer has commenced. For millions of women like Gita Devi, this small card is a key that will unlock doors to a future full of dignity and promise. Over 30000 eMitra kiosks across the State have truly taken the government to people’s doorsteps. 170+ services of 88 departments, and counting, are being delivered through eMitra. These services are provided through eMitra kiosks, web portal and a mobile application. eMitra offers facility for payment gateway of all major banks and mobile payment. 4000 of these kiosks are working as banking correspondents, and 6000 kiosks are micro-ATM enabled. Mahesh is not only the mascot of transparency, ease of access and responsiveness in citizen services, he is also a successful and respected entrepreneur. Bhiyaram & his two brothers had been struggling for over fifty years since their farm land was mistakenly marked as residential land in revenue records. At the same time, their residential area had erroneously been marked as farmland. Conscious of the sufferance of farmers due to non-disposal of revenue cases, the state government organized Nyay Aapke Dwar (Justice at your Doorstep). Revenue courts were organized at every Gram Panchayat. 72 thousand old and about 3.5 lakh new cases were disposed within 75 days. Besides, over 5 lakh land records were rectified. Delayed justice was finally delivered to people like Bhiyaram across the State. IT’S AMAZING HOW MY PENSION CAME DIRECT IN MY BANK ACCOUNT… HERE, LOOK AT MY PASSBOOK. Kanhaiya Lal’s dull eyes glow up at the mention of his bank account, his first, that the state government opened for him when he enrolled for the Bhamashah Yojana, earlier this year. Like him, millions of people in the State are now getting cash benefits direct in their bank accounts without having to wait or to follow up. They get an SMS notification on their registered mobile about the transfer. And it takes a small walk down the lane in his own village to withdraw cash from the banking correspondent with a micro ATM. A unique and robust IT-enabled benefit transfer platform, Bhamashah is also powering transfer of non-cash benefits such as ration through PDS shops. THIS ORANGE MACHINE “KNOWS” ME… IT DOES NOT LET ANYONE TAKE MY RATION AWAY. Nirmala places her thumb on small Point of Sale (PoS) device at the fair-price shop and the shop owner enters her Bhamashah family ID in it. The quantity of items due to her family is reflected on the screen. The amount of supplies purchased by her are entered in the PoS machine and the family account is updated. She also gets a printed slip of her purchase. Transactions at all fair-price shops in the State, around 26,500 of them, are being moved to these GPRS-linked PoS machines. This works on Bhamashah’s database and direct benefit transfer engine that enables Aadhar-based biometric identification of all residents. People also get SMS alerts for arrival of supplies at their fair-price shop and also of all their purchases. The road to the primary school in the village was perpetually blocked due to water logging owing to lack of drainage. Satya Narayan lodged a complaint on Rajasthan Sampark. A team of officials visited their village and in about 3 months, the village got a 30-foot drain making the road clean and the school accessible. Rajasthan Sampark is a grievance redressal mechanism created by the state government. Residents of the State can lodge their complaints regarding delivery of government service through its web-portal, eMitra kiosks, mobile application or by simply calling in at the call centre. The application includes SMS integration, GIS-linked inspections and visits, reality check for disposed cases, provision to collect feedbacks and extensive monitoring of the grievances. For Ganga Devi, a fair-price shop has always meant just sacks and drums. As she checks out the shelves of new Annapurna Bhandar in her village stacked with packaged groceries and personal care products, her eyes sparkle with wonder. Over 25 thousand fair-price shops in the State are on their way to becoming micro supermarkets, stocking about 160 branded products priced at a discount of 3% to 30%. Distribution of goods to these outlets will be on PPP and implementation for 5000 shops the first phase is underway. 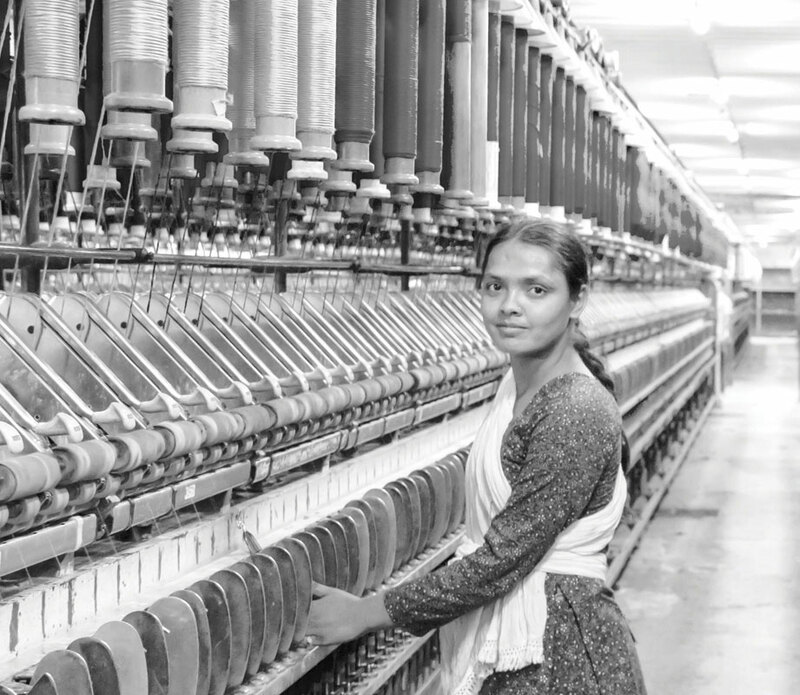 On top: Jannat, 20, operates and manages the ring frame machine at Orient Syntex in Bhiwadi, Alwar. She is from Khedli Gadasiya village in the adjoining Bharatpur district.